A few years ago, Manuel and I had a harebrained idea. It was the tail end of a never-ending winter in Germany, and we were desperate for some sun. We were also broke, which didn’t leave us many options. We needed a way to travel south on as little money as possible, and the brilliant (or so I thought at the time) solution I came up with was to take a working holiday. Nowadays, in my infinitely greater wisdom and experience, I would never dream of placing those two words side by side in the same sentence. You either work, or you take a holiday, but you never attempt to roll them into one plan, because what you get is the worst of all worlds: your holiday is ruined because you have to work, and your work is miserable because you know it’s supposed to be your holiday. It’s a lose-lose situation. Being a city girl myself, and having always had the dream of the disenchanted urbanite to ‘get back to my roots’ and ‘learn something about the land’, all the right conscience buttons were pressed and I fell for the idea, hook, line and sinker. Manuel wasn’t convinced, not quite understanding why he should take a holiday from work to work some more, but unfortunately for him it was too late because I had already sent away money for the memberships and the little WWOOFing book of farm descriptions in France. We settled on two criteria that our farm must have: the owners must be French (laid back about work, plenty of good food), and the property had to be south (sun, sun and more sun). According to the farm guide there were a surprising number of foreign-owned farms in this part of France, owned by people with names like Vanderdoof and Bjørnsen, and also a surprising number that were looking for help with things unrelated to farming at all, such as reconstructing old barns. After much searching we finally settled on one that sounded nearly perfect: the owners’ names were clearly French, the property lay “among chestnut woods, beside a small river” in the Aveyron, a region in the southwest we had never visited, and the setup was described as “smallscale fruit and vegetable farm; goats and organic cheesemaking”. And to top it off, the owners claimed to speak fluent English and German. Wow, what more could we ask for? We sent off a letter begging to be taken on for a few weeks, and within days had our acceptance. Day 1 – We arrive late at night, exhausted from a 15-hour drive, and meet our hosts. ‘Alan*’ is not the weatherbeaten chain-smoking French farmer we expect, but an ex-hippy jazz musician from Portland, Oregon. ‘Marie*’ is at least fifteen years older than her husband, has pink hair, long skirts and a permanently exasperated expression, and comes from southern England. They usher us to our sleeping quarters, a 1950’s era caravan parked about a kilometer out in their fields. “Please don’t come inside during the night to use the toilet,” Marie instructs, “just use the field.” It rains torrentially all night long. Our caravan leaks. Day 2 – Goats are the order of the day here. Before we’ve even met the little beasties, we’re served goat milk with our tea (no coffee) and goat yogurt with canned fruit for breakfast. Having been awake most of the night trying to plug leaks, we’re famished. Marie gives us crusty old overalls and boots and leads us out to the goat patch to begin our work. There are four crotchety female goats, leering at us from the end of their tethers. Manuel is put to work shoveling goat droppings from the floor of their shed. I’m instructed to collect branch cuttings that litter the field from a recent pruning effort. Lunch is goat cheese, and a salad. The salad is crunchy, peppery, and surprisingly good, but the goat cheese is rubbery and bitter. “I made it this morning,” Marie proclaims, “just curdled the milk and pressed the curds into balls.” Dessert is more goat yogurt. Day 3 – Still raining and we’re back in the goat shed. We’ve been asked to move an old mattress from one corner of the shed to a truck outside. The goats, apparently not having been told mattresses are for sleeping on, have been using it as a toilet for the past seven years. It’s not a pretty sight. We discover that Alan actually has nothing to do with the farm part of things, which explains why Marie has been the one doling out work. He has a music studio set up in an outbuilding, where he disappears for most of the day and night, the only sign of life being the occasional jazz riff carried over from the barn on the breeze. We also discover that there’s not actually much of a farm, in the true sense of the word; a scraggly and not-currently-producing vegetable patch lies to one side of the house, a few fruit trees adorn the other, and the aforementioned goats squabble with a small contingent of chickens in the animal pen. I’m proudly told that they’re ‘almost self-sufficient’ here. Day 4. While nothing here is currently being grown to sell, Marie and Alan have other plans. What is currently lacking in the markets of southwest France, they’ve noticed, is hot chile peppers. They take us to their makeshift greenhouse, where hundreds of little baby serrano and scotch bonnet pepper plants are struggling to escape their containers. “Do French people eat these spicy chiles?” I ask dubiously. “Of course not, because they’re not available here yet!” Somehow I have my doubts. We’re discovering what the harsh reality of ‘self-sufficiency’ is all about. Goat-flavored delicacies are coming out of our ears at breakfast, lunch and dinner, with the balance being made up of things they were able to can and bottle last time their garden produced something. It’s been days since we’ve had coffee, chocolate, sugar, meat… I’m still impressed by Marie’s salads, though. It turns out Marie and Alan don’t even speak basic French, despite the fact that they’ve lived here for seven years (and the German listed on their info sheet? Don’t even ask.). They rely on their two daughters to translate everything for them, the girls having picked up fluent French at school. My fondness for the two girls grows inordinately when I realize they taunt their parents by gossiping in French behind their back. -up, until we discover that we share our loft with a colony of night-active rats, who don’t seem particularly plussed about the company. Luckily we’re not rat-ophobes, so we grin and bear it. I’m getting a bit distressed about the food situation and imagine I can already feel my pants getting looser. Although I informed Marie about the fact that I have to avoid wheat at the moment and she assured me it would be no problem, I understand that it’s actually going to be no problem for her, but it is going to be a problem for me. Dinner the night before consisted of kidney beans and spaghetti, and Marie surprised everyone by baking a goat-milk and plum clafouti for dessert. All I could do was sit there with my plate of kidney beans, fighting back an onslaught of tears. Day 6. Two things happen today. I can’t take the deprivation any longer, and as soon as we finish work, Manuel and I jump into the car and drive the thirty miles or so to the nearest town in order to find a supermarket. We buy bagfuls of chocolate, runny cheeses, sliced saucisson and pates, and we sit in the car shoveling it in like we have just escaped a famine. Secondly, Marie announces that she has to make an unexpected three-day trip to Toulouse, so we’re on our own for the rest of the week. “I’ll have to ask you to take over the cooking duties,” she solemnly informs me. I can hardly contain my glee. Before she leaves, she takes me out back and shows me the secret of her marvelous salads: everything is hand-foraged, not from the vegetable patch, but from wild nooks and crannies all over the property. She shows me how to identify wild lamb’s lettuce, chives, tiny arugula shoots, and dandelion greens. She shows me how she carefully cleans each stalk, with meditative-like focus, and lightly dresses them with walnut oil and a tiny splash of red wine vinegar. In all, from field to table it’s less than forty minutes, and the peppery greens are so fresh I can almost feel them come alive again in my mouth. Days 7-9. We’re on our own and the transformation is astounding. We spend our afternoons leisurely hanging out with Alan and the kids, listening to his latest jazz creations and discovering each others’ witty and disarming sides. Plundering the food stores, I cook goat cheese and pumpkin soufflé, beans with garlic-sauteed wild arugula and plum chutney. Everyone raves, announcing they’ve never tasted food so good. Manuel has forsaken the goats and spent his days planting potatoes, which infuses him with euphoria. The sun even peeks out from time to time, which makes my daily salad picking a sublime pleasure. As I kneel down in the weeds I breathe deeply and feel an unexpected gratefulness toward the wet earth. Day 10. Marie is back, along with the rain, and before she can send us back out to the goat shed, we announce we are leaving. “But we had a contract!” she sputters. “I’m sorry, but the weather has just been so bad, and it’s our only holiday…” I answer feebly, too ashamed to tell her that the realities of ‘farm’ life, and the abysmal state of her cooking, have gotten the better of me. We bid a reluctant adieu to Alan and the girls, who have gone back into hiding, throw our belongings in the car and head off, giddy with relief at having escaped our capture. If this were a movie, you would have seen us driving off into the sunset, singing along to some upbeat French music on the radio, and looking at the endless possibilities on the map. In reality, we had a tent and a little money and another week of holiday, and miraculously, I seem to recall that as we rounded the first bend on the road towards the south, the clouds blew away, the sun came out like a warm blanket, and the stench of goat turds began to fade from our memories. Epilogue: We did find the sun we were after, deeper into Provence, and somehow we arrived back home feeling tanned and refreshed, the memory of the previous weeks already fading into the past. I must say that the farm stint was an experience I’m not inclined to repeat any time soon, but it wasn’t a total loss. I do feel I have a more realistic view of living off the land now – it’s definitely not the romantic ideal many of us city-folk hold. On the other hand, I’m still a little miffed that despite all we labored, we didn’t learn very much at all about farming. There was one very valuable thing I left with, however: learning how to gather my own wild salad was one of the greatest culinary epiphanies of my life, and I will be eternally grateful to Marie for showing me there is such a simple way to gain sustenance from the earth. I now believe more than ever that when you have the freshest, highest-quality ingredients to start with, less is definitely more, and the most honorable way to pay your respect to this bounty from the soil is to leave it as nature provided it – simple, healthy, unadorned, perfect. Begin by washing the salad very carefully by submerging it in water and gently massaging it. Drain and dry it well. Take a large salad bowl, and begin by rubbing the inside of the bowl with the cut side of the garlic until it feels tacky and smells wonderful. Throw away the garlic, or use it for something else. Now, add the salad leaves and sprinkle on a pinch of salt. Pour some olive or walnut oil on your hands (make sure they’re clean! 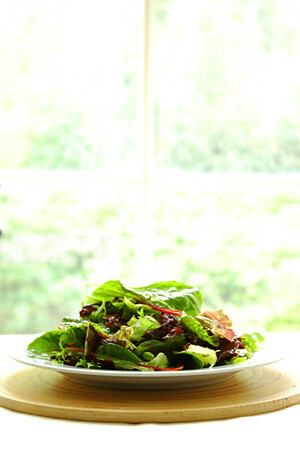 ), and slowly start tossing the salad with your hands, gently coating each leaf with oil. Pour more oil on your hands and repeat, until all the leaves are coated with a fine sheen. Taste a leaf, and sprinkle on more salt if if the salad needs it. Dribble a little bit of vinegar in the bowl, toss one last time, and grind on some black pepper. The sooner you eat this, the better it will be. *names have been changed to protect their identities! mmmmm. goat turd..horrible vacation, but a great story 🙂 I love the idea of putting the oil on your hands to dress the salad.. going to change my ways from now on! LOL! Funny story! The salads sounds just like the one they do at one of my favorite restaurants – simple ingredients, but it’s the best I’ve ever had! Mmm. foraged salads are so lovely. Your site is great.I am dismayed to hear about your WWOOFing experience however. My boyfriend and I are hoping to travel come September on a small amount of cash and we were hoping to take advantage of some WWOOFing situations. We will have to be careful. . . yikes! Hi Gemma! I know this sounds like quite a horror story, but I’m certain this farm was definitely not the norm. I’ve known people who really loved WWOOFing and made lasting friendships with their hosts. I would advise you to contact the people you’re considering working for ahead of time and ask some questions, just so you get a feel for them and the situation. But I say go for it! Chances are you’ll meet some interesting people, see some out-of-the-way places, and hey, even if everything goes wrong, you’ll still have gotten a funny story out of it! Yvonne – That’s quite a story in itself, that chocolate craving of yours! Thank you so much for leaving such a wonderful comment – it’s reading things like this that really make all the hard work and extra calorie consumption that this website entails worthwhile 🙂 But really, I’m tickled pink that you’ve enjoyed reading these stories, and I’m even more tickled that you took the time to let me know! Hi Melissa,Your story is amazing… It s not a good advert for goat cheese though. France is full of surprises, not only because of its exported food, but also because of its imported people… this is why I moved to Switzerland to eat Gruyere!!! "JUST. USE. THE FIELD." I would have hightailed it out of there right there and then; I am not a fields and bushes afficionada. :-)I read this storywith enormous pleasure and a certain sense of recognition: my daughter spent months last year on the road and WWOOF-ing, and, although she had mostly very positive experiences in England and Ireland, her tales of two farm stays in Italy bear a strong resemblance to yours. In her case, though, the food was the only redeeming factor…that, and the scenery. :-)I remember liking the Aveyron when we camped there years ago….but sunshine, of course, blesses memories. Fantastic blog you have here! I stumbled upon a link to it when I was tooling around Pinterest… so glad I did. Although I've never had a farm experience like you have described here, I'm sure I join your other readers in flashing back to some of our own "less memorable" vacations where we encountered bad food, bad weather, bad people, or worst of all, a bad bed. Such is the stuff of life! At least you walked away with a savvy on how to make a great salad. What could be better than that?